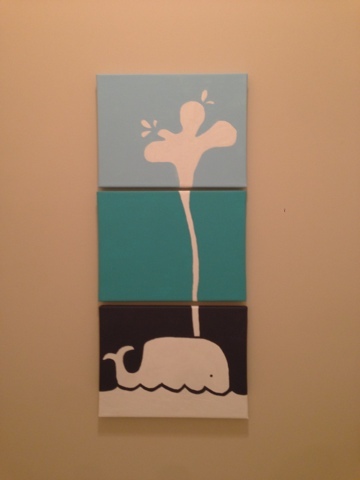 In a continuation from last weeks project theme, this week I did another piece of artwork for Perry's bathroom. I saw a picture on pinterest and thought I would give it a try. Supplies were 3 canvases, 3 colors of paint (plus white), paint brushes and a pencil. I free handed the image lightly with pencil first (and definitely erased and re-drew parts of it multiple times). Then I painted the white areas since I figured that would look better than blank canvas. My brush strokes on the water portion unintentionally wound up looking like waves. Then I took different sized brushes and painted the rest being sure to cover my pencil lines. The whole project took maybe 1.5 hours initially then another 30 minutes the next day to touch up. You could do any colors, but I used the same ones I saw on pinterest because they happened to match the bathroom. 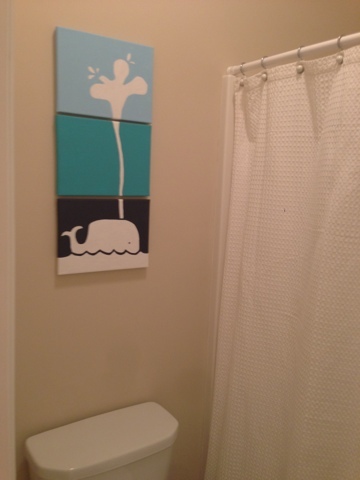 We hung it over the toilet and I love how it turned out! I am so close to having his bathroom pretty much "done." One more project to go.